CRAWFORD, Fred Lewis, a Representative from Michigan; born in Dublin, Erath County, Tex., May 5, 1888; attended the public schools, business college at Peniel, Tex., and the University of Michigan at Ann Arbor; engaged in accountancy at Des Moines, Iowa, and Detroit, Mich., 1914-1917; built, financed, and operated beet sugar mills in various sections of the United States 1917-1935; also engaged in manufacturing, ranching, and overland transportation; director of the Michigan National Bank and the Refiners Transport & Petroleum Corp. of Detroit, Mich., at time of death; elected as a Republican to the Seventy-fourth and to the eight succeeding Congresses and served from January 3, 1935, to January 3, 1953; unsuccessful candidate for renomination in 1952; retired to his farm at Allentown, Prince George's County, Md. ; died in Washington, D.C., April 13, 1957; interment in Cedar Hill Cemetery. Papers: 1951, 2 items. A cover letter and 13 page speech by Fred L. Crawford attacking the administration's Asian foreign policy. Topics include the Japanese peace treaty with China, US interests in the Philippines, the Korean War, and the military budget. Papers: 1925-1953, 6 linear feet and 1 volume. The papers of Fred L. Crawford include correspondence, newspaper clippings, scrapbooks, speeches, and other miscellanea relating to his political career, especially the election campaigns of 1936, 1940 and 1952. The papers also contain material relating to his trips to the Philippines in 1935 and 1946, and a scrapbook from 1938 concerning the activities of the Federal Bureau of Investigation, including letter from J. Edgar Hoover. Also included is a scrapbook from 1936 containing newspaper clippings and campaign miscellanea concerning his re-election campaign in 1936, as well as photographs. A finding aid is available in the library. Papers: In the Fred Dustin Papers, 1886-1957, 4.5 linear feet and 1 volume. Correspondents include Fred L. Crawford. A finding aid is available in the library. Papers: In the Fred Warren Green Papers, 1881-1939; 2 linear feet, 1 oversize folder, and 5 volumes. Correspondents include Fred L. Crawford. Papers: In the Joseph Ralston Hayden Papers, 1854-1948, 56 linear feet and 1 oversize folder. Correspondents include Fred L. Crawford. A finding aid is available in the library and online. Papers: In the Howard Cyrus Lawrence Papers, 1916-1966, 25 linear feet and 2 volumes. 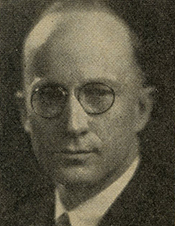 Correspondents include Fred L. Crawford. A finding aid is available in the library. Papers: In the Fred W. Litzner Papers, 1900-1966, 1 linear foot. Correspondents include Fred L. Crawford. Papers: In the William Butts Mershon Papers, 1848-1943, 47 linear feet. Other authors include Fred L. Crawford. A finding aid is available in the library and online. Papers: In the Stellanova Osborn Papers, 1916-1992, 40 linear feet. Other authors include Fred L. Crawford. A finding aid is available in the library. Papers: In the Charles M. Ziegler Papers, 1928-1959, 2 linear feet and 9 volumes. Correspondents include Fred L. Crawford. A finding aid is available in the library.